The range of his work is amazing. His portraits vary in quality, I would guess; according to the number of sittings he was able to exact. The faces of the children of Cosimo I are somewhat doll-like but their costumes are painted with the most consummate ‘trompe l’oeil’ skill. This is true of many of his paintings. His attention to detail is breathe-taking. His best hands can compare with the greatest. When you add to this the beauty of his colour, the gorgeous rhythmic texture of his low-relief type subjects, his mastery of mannerist composition generally, the near VanEyk quality of his best portraits – the word ‘genius’ must spring to mind. The sensuality, range and sensitivity shines through the Mannerism. There is a newly attributed Crucifixion which extends the range of his painting still further. The extreme austerity of the treatment of this much used subject, holds one spellbound. Little wonder it has evaded recognition for so long. It is not typical, yet this most varied painter is surely it’s author. There is a small book “Bronzino Revealed” which contains a conversation between the experts which helps one to understand the cultural context in which he worked. It whets one’s appetite for his poetry but without sufficient examples. Nor does it divulge the secret of the new varnishing treatment that allows one to appreciate the consummate skill of the painter even though the varnish is so reflective that at times one seems to be looking through glass. The museum is devoted to the history of the making of art. The museum’s collection has accumulated over the last forty years as a result of stumbling on the unexpected . When I see something inconsistent with my experience – I seek to explain the inconsistency. This has led to a sequence of art discoveries which could bring about a new understanding of art. Artists understandably keep secrets about their methods to maintain an advantage over rivals within their profession. Centuries later their secrets often remain hidden. This may happen because of our desire for super-heroes – we want to believe in the magical. This museum is about delving into the truth about how things were made, based on the artefacts themselves, questioning the art mythology. We have concrete evidence that the Classical Greek sculptors did not follow the “proper” art school procedure of observing from a life-model but used a hollow wax cast taken from life. This came as a great shock. It has upset our sense of where we come from. It requires the revision of Art History. By following the clues present in all the life-size bronzes that survive from the Severe and Classical periods we are led to a very different conception to the one we have accepted for the last 2500 years. Long ago Pliny reported that life-casting was invented by Lysistratus around 350BC but few historians have acknowledged this possibility. In fact my discovery pushes that date back to around 500BC; the moment when the great Greek revolution changed the course of history with the discovery of natural movement: the famous Greek contraposto. We must now see this leap forward, more as a technical advance, rather than a leap of the imagination. Up to that time the Greeks had followed the Egyptian pattern but less successfully than the Egyptians. Their revolution all happened too quickly, in less than 50 years. Nonetheless my concrete evidence, like Pliny’s report, is neglected. My most important discovery is Rembrandt’s need to have life in front of him when drawing or painting. In the museum we will see that Rembrandt was a different and inferior artist if he didn’t work from life. Rembrandt’s genius is based on his observation of human interaction: body language, which he conveys through his precise observation of space relationships, usually set up in his studio with live models and theatrical properties. The importance of his use of mirrors is that it shows us definitively how Rembrandt worked . The experts’ ideas about the development of his style are wrong. The relationship between Rembrandt and his students are also gravely misleading. Though he could not work out of his head, Rembrandt’s imagination was more serious than is commonly meant by the term. Coleridge, a poet who thought very deeply about imagination, distinguished between “fancy”(fantasy) and true imagination. The brain receives the world through the senses but we all need imagination to make sense of these perceptions. Rembrandt made new and better sense of what he saw, psychologically, using his genuine interpretive imagination. If our experts could take Rembrandt’s and Coleridge’s lessons to heart the future course of art and criticism would be of much greater value to us. Rembrandt is clearly the most evolved artist that has ever existed. Yet we have witnessed a steep decline in his perceived stature because the art historians refuse to revise their time honoured misunderstandings. They rely too unquestioningly on the literature of art, (including the artists’ own self-promotions) and seem unable to interpret the primary evidence, the artefacts. 1. An appreciation of the works of Rinaldo da Siena recently discovered under the cathedral. 2. Reasons why the so called “Duccio Window” cannot be by Duccio. 3. The discovery of the dimension of time in Simone Martini’s Madonna of the Annunciation. 1. The probable use of a polished silver mirror in Brunelleschi’s second essay in perspective. VELASQUEZ’ use of a large mirror from the Hall of Mirrors at the Royal Palace in Toledo for the composition and rapid completion of his most important masterpiece – “Las Meninas”. VERMEER’S use of two mirrors in conjunction with a camera-oscura as an aid for painting. If there were space available in some future museum. I would like to include some of David Hockney’s discoveries as presented in his fim and book “Secret Knowledge”. He is another artist who has made a very considerable contribution to the true history of Art. I found his suggestions about the use of the concave mirror very convincing and also his demonstration of Caravaggio’s methods. In the museum you will see that I have something to add to his ideas about Brunelleschi, Velasquez and Vermeer. What he had to say about Flemish, as opposed to Florentine perspective, I found positively illuminating. Perhaps it could only be explained so well by an artist such as Hockney, who uses photo-collage. There is so much I disagree with in the Getty catalogue it will be quicker to name those parts with which I have no argument. There are two students of Rembrandt who though not great are perfectly decent workaday draughtsmen. Their names are Renesse and Hoogstraten. Their style of drawing is not like Rembrandt’s and therefore they have not benefited from the recent handout of drawings that the “experts” have de-attributed from Rembrandt’s portfolio. I do argue with two others who come into the same category of good, workaday draughtsmen whose work does not in the least resemble Rembrandt’s but have nonetheless benefited from re-attributed Rembrandt drawings. Eekout and Flinck. By what convoluted argument they have been so lucky, the catalogue does not explain. There is the strange case of Carel Fabritius who was a fine painter but left us no certain drawings. This is not unusual as some painters paint over their preparatory drawings, which were done directly onto the canvas (like Hals and Vermeer). CF has been gifted two very fine and typical Rembrandt drawings, on what grounds we are left to guess. Without comparisons there is nothing to argue about. But he is likely to receive more of the same in future madness. Johannes Raven, is a comparative newcomer to Rembrandt’s supposed stable of assistants or students. He wrote his name on the back of a drawing, which while not being one of the greatest is almost certainly by Rembrandt. 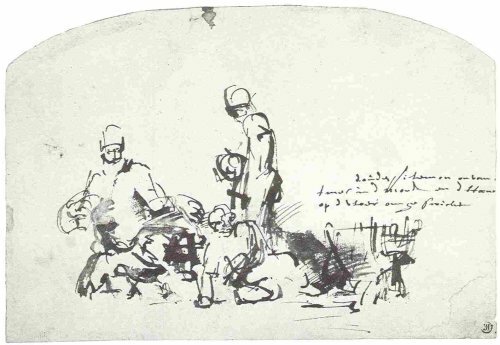 (Rembrandt did many careful drawings in preparation for his etchings, they have all been re-attributed. This looks like one of those.) Had Raven written his name on the front we could agree that he was at least claiming it as his work. However, by signing on the back, I would guess he was only claiming ownership. Surely we all write our names in books for that purpose. Luck was on Raven’s side, the “experts” have overlooked that possibility. A whole raft of life drawings by Rembrandt (mostly of his mistress Hendrijke Stoffels), are now re-attributed to Raven! Most outrageous of all is the case of Ferdinand Bol whose work as a draughtsman scores a lot lower than the category of decent, workaday. Bol has benefited from a large number of really good or great drawings by Rembrandt. Rembrandt once gave him such a magnificent demonstration of draughtsmanship relating to his, Bol’s, painting of Hagar and the Angel. If, with eyes tight shut, we attribute that drawing to Bol there is no reason why he should not have done other great Rembrandt drawings. With eyes open this mirage vanishes. But the fact remains that at this moment Bol appears great, due to gross misjudgements. With little merit, he has had greatness, thrust upon him! Those, like Bol, that have benefited from the handout, very much diminish Rembrandt’s stature and obscure his unique contribution to the art of drawing. We now see Rembrandt surrounded by a team of gifted mediocrities, who have made quantum leaps on occasion and who will in due course inherit more of Rembrandt’s greatness, unless, of course, we can unseat the present regime. The uncanny feebleness of modern scholars can only be the result of promoting the most loyal and unquestioning students over several generations of scholarship. They don’t seem to possess eyes or minds of there own. They religiously follow the now untenable theories of their teachers. Benesch told us that Rembrandt’s “inner vision (of the Biblical subjects) was as if he had seen them in reality”. My experiments demonstrate that he “produced” them in reality by the use of models and that is part of the reason why they are so much more convincing than other artists’ inventions. Unfortunately, for generations we have been fed the idea that what is imagined is superior to what is observed. (Rembrandt himself would have laughed at such a notion.) It is therefore, difficult to persuade today’s art students that they should follow Rembrandt’s example and feed their imagination on reality. Thus, the mythology of Art History has undermined a well tried road to improvement. The “imagination” mythology is yet more dangerous because it diverts our attention from the real world in which we live. Without attention we will falter. CONCLUSION I hope with these four critiques aimed at the most recent example of Rembrandt scholarship I have conveyed the urgent need for change. The evidence I have put before you was all there in my Burlington article of February 1977, I have simply amplified it to the point where one can claim that there is no possible room for further doubt. Rembrandt did use large groups of live models, dressed in his extensive theatrical wardrobe, as in the “Adoration of the Shepherds”(see film on YouTube where it is possible to compare the paintings with the photos of the maquettes) on many occasions. An unbiased eye could have deduced the same from a fairly casual perusal of his collected drawings. The mirrors were a proof, which has still not been acknowledged. It needed a desparately biased collective eye to deny the obvious. Many thousands of students have had the wool pulled over their eyes since 1977. This must stop! atelier Rembrandt and Lievens met as students. Lievens. His early Leyden works are very strongly influenced by Lievens. that idea. Perhaps I should attempt to explain their strange behaviour. media or different stimuli: reality, reflection or imagined. view point of the physical groups of models in Rembrandt's studio. psyche in the physical world. obviously draw them from memory, unlike his angels. other figures express shock as we would expect from Rembrandt. make a far better job. Our experts are to be pitied, not to be listened to. our failures and then learn from them. to the actual occurrence (the Bible story). This was a part of his art. that he spent equal time arranging his actors. which only occasionally end with the hoped for, pot of gold. Ex.10, B.960 Jupiter with Philemon and Baucis, an illuminating inability. Rembrandt has had to write the story that the drawing fails to tell. as the great Rembrandt shrinks; they must be stopped!